Growing plants in containers is a great way to bring life and colour into otherwise dull spots in your garden. Patios, balconies and window boxes are all places where plants can be easily introduced in containers. Plants in containers do require more care than those in gardens, but by following our advice you will find this easy. Almost any type of plant can be grown in a container. Generally, the bigger the pot and the plant, the easier it is to care for. Soft, fleshy, leafy plants such as tomatoes and fuchsias are more demanding than ‘leathery’ plants such as pelargoniums (tender geraniums) or lavender. 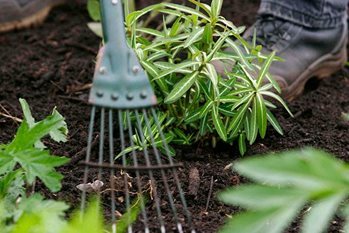 Plant in early spring so that plants quickly put out roots and become established. Autumn planting may lead to losses from waterlogging and evergreens may deteriorate over winter from dryness at the roots or wind-burn of the foliage. Watering is one of the most important jobs when growing plants in containers. Not enough water will cause plants to dry out, and maybe die. On the other hand, overwatering is very damaging as most plants do not like sitting in water. See the advice below on summer care and winter care for information on watering plants in containers. See the advice below on summer care and winter care for information on feeding plants in containers. Overwatering is the most common cause of loss of container plants; watering should aim to keep the compost moist, never soggy and avoid alternating dryness and saturation. Overpotting is another common cause of problems.